The Nakajima Ki-44 Shōki (鍾馗, Zhong Kui) was a single-engine fighter aircraft used by the Imperial Japanese Army Air Force in World War II. The type first flew in August 1940 and entered service in 1942. The Allied reporting name was "Tojo"; the Japanese Army designation was "Army Type 2 Single-Seat Fighter" (二式単座戦闘機). It was less maneuverable than its predecessor, the nimble Ki-43, and pilots disliked its poor visibility on the ground, its higher landing speed, and severe restrictions on maneuvering. Yet, the Ki-44 was superior in flight tests. It was an outstanding interceptor and could match Allied types in climbs and dives, giving pilots far more flexibility in combat. Moreover, the armament (including in some versions two 40 mm cannons) was far superior to the older Ki-43. These characteristics made the fighter an effective B-29 Superfortress destroyer and one of the Japanese High Command priorities during the last year of war. But poor pilot training in the last part of the conflict often made them easy targets for Allied pilots. Nakajima began development of the Ki-44 in 1940 as a pure interceptor with emphasis being placed on airspeed and rate of climb rather than maneuverability. The Japanese Army Air Force specification called for a maximum speed of 600 km/h (370 mph) at 4,000 m (13,130 ft), to be attained in five minutes. A set of Ki-43 like "butterfly" combat flaps was fitted for improved maneuverability. Armament consisted of a pair of 7.7 mm (.303 in) and a pair of 12.7 mm (.50 in) machine guns. The engine selected for the new interceptor was Nakajima's Ha-41 14-cylinder double-row radial, originally intended for bomber aircraft. Although the Ha-41 was not the ideal choice due to its large-diameter cross section, the design team was able to marry this engine to a much smaller fuselage with a narrow cross section. In order to achieve its design goals, the wing area was relatively small leading to a high wing loading and a comparatively high landing speed that could be daunting to the average Japanese pilot, who was more used to aircraft with a low wing loading like the Ki-44s predecessors, the Ki-43 and Ki-27. The first Ki-44 prototype flew in August 1940 and the initial test flights were generally encouraging, with handling considered acceptable considering the high wing loading. Problems encountered included a high landing speed and poor forward visibility during taxiing due to the large radial engine. The pre-production Ki-44 aircraft and two of the prototypes were turned over to the Army for service trials on 15 September 1941. The type commenced operations with one experimental unit, the 47th Chutai (Independent Air Company) ("Kawasemi Buntai", Kingfisher Unit) sent to Saigon, Indochina in December 1941 with nine aircraft under the command of Major Toshio Sakagawa. The unit later became the 47th Sentai, when flying home defense in Japan. More aircraft were later sent to China, and others were used in defense of oil wells in Sumatra, Indonesia, the China-Burma-India theater of operations, Philippines, Japanese metropolitan defense (mainly concentrated around Japan's large industrial cities) and even kamikaze operations in the last stages of the war. The Ki-44-2c version of the "Tojo", armed with heavy cannon, was used against B-29s by one special kamikaze unit (a company of four aircraft minimum) of the 47th Sentai, which specialized in bomber collision tactics, the Shinten unit ("Shinten Seiku Tai"(Sky Shadow) 47th Sentai (Air Regiment) based at Narimasu airfield), during the defense of Tokyo. The Nakajima Ki-44 at one point equipped 12 sentais of the Japanese Army Air Force (the 9th, 22nd, 23rd, 29th, 47th, 59th, 64th, 70th, 85th, 87th, 104th and 246th Air Regiments (Sentai)) which saw action before their (partial) replacement with Ki-84 Hayates for the final battles of the war. The Manchukuo Air Force also received some examples of these aircraft during wartime. 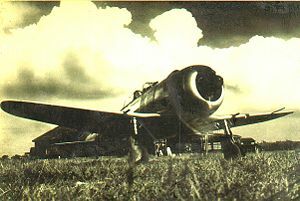 After World War II, the Nationalist Chinese 18th Squadron of the 12th Fighter Group was equipped with Ki-44s formerly of the 9th Sentai, which had disbanded in Nanking, and of the 29th Sentai, which had disbanded at Formosa and they participated in the Chinese Civil War. The People's Liberation Army Air Force managed to get hold of aircraft formerly belonging to 22nd and 85th Sentai, who had disbanded in Chosen, the Japanese name for Korea during their imperial rule (1910-1945) over that country. These aircraft were flown by Japanese mercenary pilots, who used them until the last two Ki-44s finally retired in the early 1950s. was powered by a 930 kW (1,250 hp) Nakajima Ha-41 engine, and had a maximum speed of 580 km/h (363 mph). Armament consisted of two 7.7 mm (.303 in) Type 89 machine guns and two 12.7 mm (.50 in) Ho-103 machine guns placed in the wing. Fighter Type 2 of Army. (Mark Ia). had a 1,074 kW (1,440 hp) Nakajima Ha-109 engine with a top speed of 604 km/h (378 mph), and four 12.7 mm (.50 in) Ho-103. prototype-engine Nakajima Ha-109 of 1,130 kW (1,520 hp). (Mark 2c) Four 12.7 mm (.50 in) Ho-103 or two 12.7 mm (.50 in) Ho-103 and two 40 mm (1.57 in) Ho-301 cannons. A four 20 mm Ho-3 cannon version was proposed but never produced. (Mark 3a) engine of 1,491 kW (2,000 hp) and four 20 mm Ho-5 cannons. (Mark 3b) two 20 mm Ho-5 cannons and two 37 mm (1.46 in) Ho-203 cannons. People's Liberation Army Air Force operated some aircraft captured from IJAAF and MAF. Indonesian People's Security Force (IPSF - Indonesian pro-independence guerrillas) captured a small number of aircraft at numerous Japanese air bases in 1945, including Bugis Air Base in Malang (repatriated 18 September 1945). Most aircraft were destroyed in military conflicts between the Netherlands and the newly-proclaimed Republic of Indonesia during the Indonesian National Revolution of 1945-1949. There are no reports of a flyable example of the Ki-44 at this moment. 4x� 12.7 mm (.50 in) Ho-103 machine guns, two synchronized cowl mounted (perhaps 657 rpm rate each), and one in each wing (900 rpm rate of fire each), 760 rounds in all. The 12.7x81 cartridge propelled the 35.4 g AP bullet 760 m/s, the 38 g HE 796 m/s, and the 33 g HE (2.2%) 770 m/s, with an effective firing range of 750 m. Not always reliable. Brindley, John F. Nakajima Ki-44 Shoki ('Tojo'), Aircraft in Profile no.255. Windsor, Berkshire, UK: Profile Publications Ltd., 1973. No ISBN. Ethell, L. Jeffrey. Aircraft of World War II. Glasgow, UK: HarperCollins Publishers, 1995. ISBN 0-00-470849-0. Ferkl, Martin. Nakajima Ki-44 Shoki (in English). Ostrava, Czech Republic: Revi Publications, 2009. ISBN 80-85957-15-9. Francillon, Ph.D., Ren� J. Japanese Aircraft of the Pacific War. London: Putnam & Company Ltd., 1970 (second edition 1979). ISBN 0-370-30251-6. Green, William. War Planes of the Second World War, Volume Three: Fighters. London: Macdonald & Co. (Publishers) Ltd., 1961 (seventh impression 1973). ISBN 0-356-01447-9. Green, William and Gordon Swanborough. WW2 Aircraft Fact Files: Japanese Army Fighters, Part 2. London: Macdonald and Jane's Publishers Ltd., 1977. ISBN 0-354-01068-9. "Nakajima Ki.44 (Ni Shiki Tansen Sentoki Shoki)" (in Japanese). Maru Mechanic No. 9, March 1978.